Landscapes by Land Art LLC offers irrigation installation and irrigation repair services in Orlando and Central Florida. Landscape irrigation involves distributing appropriate amounts of water to specific landscape plantings to ensure their survival and healthy growth. 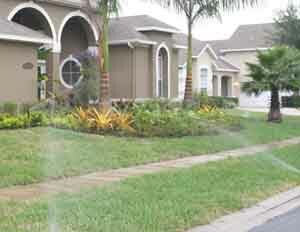 Our Orlando irrigation crews are skilled with the installation and repair of irrigation systems. Orlando irrigation systems differ in how the water obtained from the source is distributed within the landscape. In general, the goal is to supply the landscape with water, according to the needs of the plants, so that each plant has adequate, with neither too much nor too little water being consumed. This can be accomplished utilizing eitehr localized irrigation or spray irrigation systems. 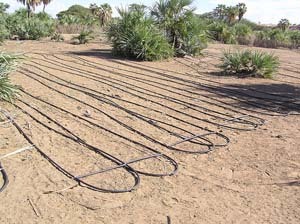 In Orlando, localized irrigation is a system where water is distributed under low pressure through a piped network, in a pre-determined pattern, and applied as a small discharge to each plant or adjacent to it. In Orlando we refer to such irrigation systems as drip irrigation, sub-surface irrigation, low water use irrigation, micro-sprinkler irrigation or bubbler irrigation. You may select to choose an irrigation system that is completely localized or a combination of spray irrigaiton system and localized irrigation system. One benefit of using a localized irrigation system is that the water management districts allow the operation of these types of systems at any time, without restriction. In spray or sprinkler irrigation, a network of underground piping is utilized to distrubiute water under high pressure through the network and to strategically placed mist and spray heads. 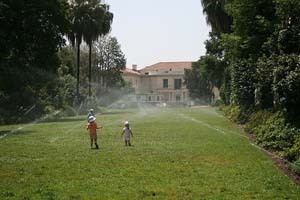 These mist and spray heads will activate, pop up from their recessed position beneath the ground and deliver water to the landscape when they are turned on by an irrigation clock or timer. As water is a prescious and scarce resource, your irrigation system will include a clock and rain sensor to control the delivery of water on a regular basis. A properly designed, installed and programmed system will offer years of worry free operation. Watering restrictions are in place to preserve the water supplies in Florida's underground aquifers. As a result of the recent changes in watering restrictions, many of our Orlando irrigation customers are deciding to convert parts or all of their irrigation systems to localized or water conserving systems. The advantage of this conversion allows our customers to more accurately control the delivery of water to their landscape plantings as restrictions in place by the Water Management Districts of Florida allow for the operation of such systems on a more regular basis. Orlando and most of the central Florida counties lawn irrigation restrictions are regulated by The St. Johns Water Management District" . Other counties and the Reedy Creek District are regulated by The South West Florida Water Management District. Please note, some customers of ours have asked if they can water their landscape and plantings by hand, the water management districts of Florida allow irrigation by a "hand held hose that is equipped with a spray nozzle that can be adjusted so water flows only as needed", at anytime. Our orlando irrigation services are available to our landscape and non-landscape customers for Orlando irrigation installation and Orlando irrigation repair customers. 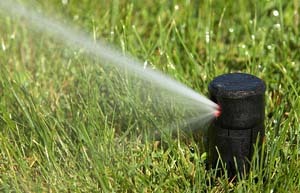 Please call us at (407) 844-6658 to discuss your Orlando irrigation needs.